Mains Paper 2: Economic Development| Indian Economy and issues relating to planning, mobilization of resources, growth, development and employment. Prelims level: Basic knowledge of the Indian economy in contemporary context. Mains level: The news-card analyses the measures to boost the Indian economy in present context, in a brief manner. As the Union budget is set to be announced tomorrow, several economists believe that private consumption, investment demands must rise to boost the Indian economy. When the current government took over in 2014, the declared fiscal deficit was at 4.5 per cent while the actual was estimated to be in the range of 5.5 per cent. It withheld income tax refunds and rolled over to the next year payments which would have ideally come in towards the end of financial year 2013-14. Coupled with weakness on the external account, India was part of a group that was informally referred to as the “fragile five” — countries being the weakest links in the global economy. Falling global oil prices were leveraged to generate better revenue for the government. Establishing audit trail and ownership of money and simplification in indirect tax structure. the current account deficit is manageable and foreign exchange reserves and GDP growth rates are inching higher. In doing so, the government has not sacrificed any essential expenditure. As per the publicly available data, the 2014-15 to 2018-19 period has seen the best combination of GDP growth rate (high) and inflation (low). Success on the macro-economic management front has been one of the biggest achievements of the government. India is not only one of the fastest-growing economy, but also the sixth-largest economy in the world. PwC’s annual Global Economy Watch report projects India’s real GDP growth in 2019-20 at 7.6 per cent. Accordingly, India is likely to surpass UK in 2019 rankings of world’s largest economies and occupy the fifth position. At the centre of all initiatives is the ordinary citizen of India and the goal is to ameliorate her condition of living. The target is to achieve a higher level of GDP growth and to make it as wide and participative as possible. In the roadmap for doing so, macroeconomic parameters are self-imposed road signs. The government should consider ground realities while making its economic policies. Currently, agriculture and allied sectors are facing some challenges due to lack of sufficient demand for their output. The Micro, Small and Medium Enterprises (MSMEs) sector is another segment that is facing headwinds due to lack of liquidity in the financial system and lack of demand. Increased demand brings in private investment and if there is resource constraint with the government, fiscal expansion is the way out. The economy will grow only when there is sufficient demand. Government expenditure has increased tremendously in the last five years and sectors like steel and cement have benefited immensely. However, private consumption and investment demands need to increase further. For this there is scope for expansionary fiscal policies, particularly when inflation is low. Fiscal discipline during the last five years has been one of the best and has given the government the elbow room to boost expenditure. injection of liquidity in the financial sector to boost credit availability. These measures might put some upward pressure on inflation which might not be such a bad thing. Cash transfers to farmers are constrained by the lack of updated land records with the state governments and a way around it must be found. Such a transfer will boost demand for agricultural and non-agricultural products in the rural areas and help the agriculture and MSME sectors. Mains Paper 2,3: International relations| Security| Effect of policies and politics of developed and developing countries on India’s interests, Indian Diaspora. Challenges to internal security through communication networks, role of media and social networking sites in internal security challenges, basics of cyber security; money-laundering and its prevention. Prelims level: Basic knowledge of India’s security challenge both at external and internal fronts. Mains level: The news-card analyses the difficult external and internal situation that India might face in the year 2019, in a brief manner. As India prepares for the general election this year, the country faces a difficult external and internal situation and it needs to remain alert to unexpected developments. A global leadership vacuum is leading to chaos concerning rules governing the international order. U.S. President Donald Trump’s utterances and actions are provoking strong counter-reactions, especially from China and Russia. U.S. Vice President Mike Pence’s attack on China, in October 2018, has signalled the beginning of a new Cold War. Mr. Trump has threatened to pull out of a major arms control treaty with Russia. Russia has also been talking of building stronger deterrence and Cold War 2 seems for real now. Russia is vigorously pursuing its pivot to Asia and for greater influence in Eurasia. It has deepened its partnership with China, and enhanced relations with Japan and South Korea. Growing tensions in the Sea of Azov (following Russia’s seizure of Ukraine’s ships) could well lead to a major conflagration between Russia and the West. China is consolidating its position in Asia. In addition to its strategic partnership with Russia, China has mended fences with Japan. Its Belt and Road Initiative has become the most potent weapon in China’s armoury, with Vietnam and Japan endorsing this concept. India finds itself increasingly isolated in Asia as a result. Economic portents during 2018 for most of the world proved highly daunting. The most challenging was the spectre of an all embracing U.S.-China trade war. This had triggered highly unsettled conditions, and the situation was further aggravated by signs of a weakening Chinese economy. At the beginning of 2019, it is amply evident that politics is conflicting with business across the world. A decline in Britain’s financial assets and of the pound sterling following Brexit, as well as signs of increasing fragility of China’s economy, are newer concerns. The likelihood of the U.S. moving into a period of slower long-term growth, one that is likely to continue for a fairly long time, is aggravating this situation. India cannot hope to remain insulated from these trends. Coming to India’s foreign policy concerns, relations with Russia and Japan could see a reset. The strengthening of the Russia-China strategic relationship and the recent warmth in China-Japan relations could impact India’s relations with both countries. Notwithstanding the warmth displayed in public by the leaders of India and Russia, and India and Japan, the character of our relations with these two countries could undergo a change. What is evident is that India will need to expend a great deal of its diplomatic capital to ensure that relations do not decline to any considerable extent. Managing relations with China will be India’s top priority. India-China relations are marked by a surface calm, but this masks an intrinsic struggle for influence in Asia and even beyond. The Wuhan Spirit, notwithstanding, little has changed as far as India-China relations are concerned, except that there has not been any major Chinese incursion across the disputed India-China border. In 2018, China had initiated certain moves to create a China-Myanmar Economic Corridor on the lines of the China-Pakistan Economic Corridor (CPEC). The Chinese Navy is also poised to challenge India’s position in the Indian Ocean. Chinese submarines already outnumber India’s here. China is preparing to outflank India by seeking control of the Kyaukpyu Port on the Arakan Coast in Myanmar, and planning a canal (the Kra canal), connecting the Andaman Sea with the Gulf of Thailand. Together with China’s existing control over the Gwadar (Pakistan) and Hambantota (Sri Lanka) Ports, if China were to succeed in its attempts, it could give it a stranglehold across the Indian Ocean Region. India’s capacity to counter such moves in 2019 appears extremely limited. This year could also see a further consolidation of the ‘all weather friendship’ of China-Pakistan. During 2018, Pakistan facilitated China’s involvement in Afghanistan (and also succeeded in co-opting Russia to be a party to talks with the Afghan Taliban). The CPEC having weathered quite a few storms in 2018, seems well set to progress this further in 2019. The prospects of India-Pakistan relations improving on the other hand, are extremely limited. Cross-border terror attacks are likely to continue, as also sponsorship of terror groups like the Lashkar-e-Taiba and the Jaish-e-Mohammed. Where India will face even rougher weather is in Afghanistan where the Afghan state is perilously close to imploding. India has been kept out of talks with the Afghan Taliban by all countries concerned, including the U.S., China, and Russia, apart from Pakistan. This is making India’s position here highly invidious. The outlook for India in the rest of South Asia is also mixed. Towards the end of 2018, India could retrieve its position in the Maldives. It also succeeded in re-establishing its influence in Bhutan. The return of Sheikh Hasina as Prime Minister after the general elections in Bangladesh has been a welcome relief. Yet, India will need to work harder in 2019 to check China from weaning away its neighbours, including Nepal as also Bangladesh, with offers of economic and military aid. India will also need to use all its resources to assist Bangladesh to limit the influence of radical Islamist groups there. Internal security, for the better part of 2018, remained on a relatively even keel. There were fewer Pakistan-sponsored terror attacks, but this is hardly an index of what lies ahead in 2019. Left extremist violence went up marginally in 2018, but the movement remained circumscribed within a core area in Chhattisgarh, Andhra Pradesh, Maharashtra, Odisha and Jharkhand. Ideologically, the movement has remained vibrant, and in 2019, both ideological and militant aspects will need deft handling. In 2018, the situation in Kashmir sharply deteriorated, and the year witnessed some of the highest levels of violence since 1989. There was again a sharp spurt in the number of security forces personnel being killed, alongside targeting of their families. The deadlock between the Jammu and Kashmir administration and militants is unlikely to be resolved. President’s rule has made little headway in sorting out the conflict-prone situation. Militant outfits, the JeM and the Hizbul Mujahideen, appear energised by the turn of events and can be expected to become still more active. More educated locals are joining militant ranks. Disclaimers notwithstanding, the presence of the Islamic State is also in evidence. The consequences of this as far as 2019 is concerned could be considerable. This has been simmering for some time, but now threatens to boil over, following the enactment of the Citizenship (Amendment) Bill. The Bill has given rise to fears that it would drastically alter the status quo in the region. The Amendment has helped unite vast segments of people across the entire Northeast. The divisive potential of the recently enacted Act, will have special resonance in an election year. It will demand sensitive and careful handling in 2019. Two other issues that kept the nation on the edge in 2018, i.e. farmers’ and Dalit unrest, still remain unattended as 2019 begins. Both can ignite fires, especially in an election year. There is little evidence, however, that the causes for the unrest are receiving careful consideration. Considering the difficult external and internal situation, peace in 2019 may prove elusive. On the diplomatic front, India will need to be more dexterous. The internal situation will require to be dealt with far greater understanding. Mains Paper 3: Economic Development| Indian Economy and issues relating to planning, mobilization of resources, growth, development and employment. Prelims level: Basic knowledge of minimum basic income. Mains level: The news-card analyses the case for minimum income support scheme to mitigate rural distress, in a brief manner. The government will present its last Budget tomorrow. Conventionally, the Budget presented in an election year is a vote on account, aimed at providing funds for the government to function until the formation of new government. In recent times, the vote on account convention has been followed loosely. For instance, in 2014 the Manmohan Singh-led government’s interim Budget announced the One Rank, One Pension scheme and allocated ₹500 crore for its rollout. This wasn’t an emergency measure that could not have waited until the completion of the election. The Budget also announced cuts in excise duties on some items, including small cars and capital goods, in the hope of reviving consumption and investments. Therefore, it won’t be surprising if the present government announces an income support scheme to mitigate rural distress in its interim Budget. A pilot project conducted between 2010 and 2013, covering 6,000 beneficiaries in Delhi and Madhya Pradesh have yielded encouraging results. It confirmed that at high levels of impoverishment, even the smallest income supplement can improve nutrient intake, school enrolment and attendance of female students, and reduce incidence of indebtedness. The study showed that consumption of pulses went up by 1,000%, fresh vegetables by 888%, and meat by 600% among the beneficiaries. The reforms since 1991 have largely bypassed agriculture and other segments of the economy that engage poor and rural Indians. While incomplete economic liberalisation and technological advances have led to growth in national income, all individuals have not gained equally. The disproportionate share of gains from the reforms have gone to middle-class and rich Indians. This unevenness in development calls for a superior economic growth model. Until that happens, redistributive policy interventions such as income transfers can improve equity. Income transfers are not to be confused with doles or unemployment benefits. Besides equity, there’s also an urgent need to address rural distress. This is largely a consequence of policy failures such as ineffective procurement and perverse trade and pricing policies that have in times of bumper harvests led to gluts, depressed market prices, and aggravated farmer losses. So, it is only fair that the government pays reparations to farmers in some form. In Telangana, the government is providing farmers income support payment under the Rythu Bandhu, at the rate of ₹10,000/ha (₹4,000/acre). However, this model benefits the biggest landowners the most, including those who lease out their land. Tenants, sharecroppers and landless labourers, the most vulnerable, are out of its coverage. Its success depends on reliable land records. Odisha’s recently notified KALIA (Krushak Assistance for Livelihood and Income Assistance) irons out these creases. It proposes to transfer ₹5,000 in cash per season (₹10,000 per year for double-cropped land) to the State’s 30 lakh marginal farmers, leaving out the two lakh large farmers. It promises cash grants of ₹12,500 each to the State’s 10 lakh landless households. The hope is that they will use this money to rear goats or poultry and farm mushrooms or honey. Fisherfolk are covered too, and will receive the investment support for buying fishing nets and allied equipment. Last year, the Budget had promised compensatory payments to farmers equal to the gap between depressed market prices and the minimum support prices (MSPs) announced. But MSP-based payments distort price signals to farmers on what to produce and how much in the subsequent season. Rythu Bandhu and KALIA are superior policy interventions. Plus, they do not suffer from the moral hazard and limited reach of farm loan waivers. Waivers penalise farmers who repay loans on time and benefit only borrowers from banks. The advantage of a minimum income guarantee is that it will also cover the urban poor, who are not covered in these schemes. While job guarantee programmes, such as the Mahatma Gandhi National Rural Employment Guarantee Scheme, lock up beneficiaries in low-productivity work, income supplements allow them to continue to look for better employment options. Therefore, a minimum income guarantee scheme will improve equity, address rural distress and cover the urban poor. Are these schemes feasible politically, operationally and fiscally? Income supplements can be transferred into Jan Dhan or Post Office accounts. Beneficiaries can be selected through the Socio-Economic Caste Census (the last round was conducted in 2011, the results of which were released in July 2015). Increasing the fiscal deficit hurts the poor, for it sparks off inflation and cannot be the way to fund income transfers. In 2017-18, the Centre and the States collected more than ₹5 lakh crore through various taxes, royalty payments and dividends from producers and consumers of petroleum products. Streamlining distortionary and demerit subsidies, such as on urea (₹70,000 crore annually), can open up significant fiscal space. If the wealth tax that the government had abolished in 2015 is reintroduced as a fair and easy-to-collect levy on the super-rich, an income support scheme for the poor will be easier. Taxpayers must realise that agri-prices, and therefore farm incomes, are not free market-driven. They are kept artificially low, through pricing policy instruments, so that inflation does not erode the rest of the population’s purchasing power. Mains level: India’s aspiration for a manned mission in Space. 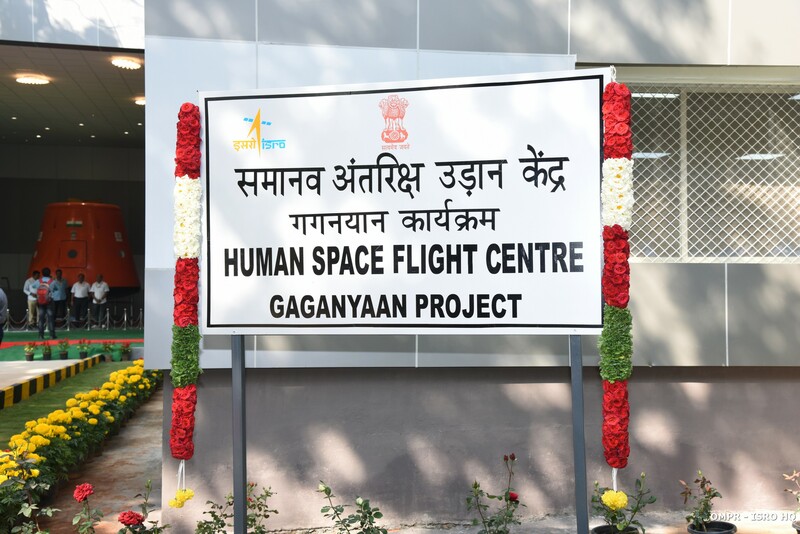 HSFC will take the support of ISRO centres to implement the first developmental [crewed] flight. Though India and Nepal had agreed to collaborate on conducting the tiger census in their countries in 2018, they’ve yet to sign an agreement on sharing detailed assessments of the numbers. It was expected that both countries would arrive at an agreement to be signed during the ongoing conference Global Tiger Recovery Programme. The Chitwan National Park in Chitwan and Parsa Wildlife Reserve of Nepal are adjacent to the Balmiki Tiger Reserve in Bihar. Likewise, Nepal’s Bardiya National Park adjoins India’s Katarniaghat Wildlife Sanctuary, while the Shuklaphant National Park in Nepal adjoins India’s Dudhwa Tiger Reserve. Nepal already publicized the results of its tiger census last September — 235, and this represents an 18% rise from the 198 tigers in 2013. However, India needs details on the locations of these tigers, which are captured via camera traps, to be sure that some tigers found on the border are not double-counted. India’s tiger census is huge and spans a vast area. However, both (countries) are sovereign and so data sharing must be on equal terms. Prior to beginning its census, India had also signed agreements with Bhutan and Bangladesh regarding sharing tiger numbers and conducting surveys using a common methodology. Both these countries had already shared data with India. An ongoing census is expected to reveal an update to these numbers. Mains Paper 2: Governance | Issues relating to development and management of Social Sector/Services relating to Health, Education, Human Resources. The University Grants Commission has deferred its decision on granting the Institute of Eminence tag to more educational institutions. The expert committee has recommended more than the mandated number that the scheme allowed. In July, the HRD Ministry hass granted the Institution of Eminence status to three public and three private educational institutions in India after the empowered expert committee recommended 11 names. 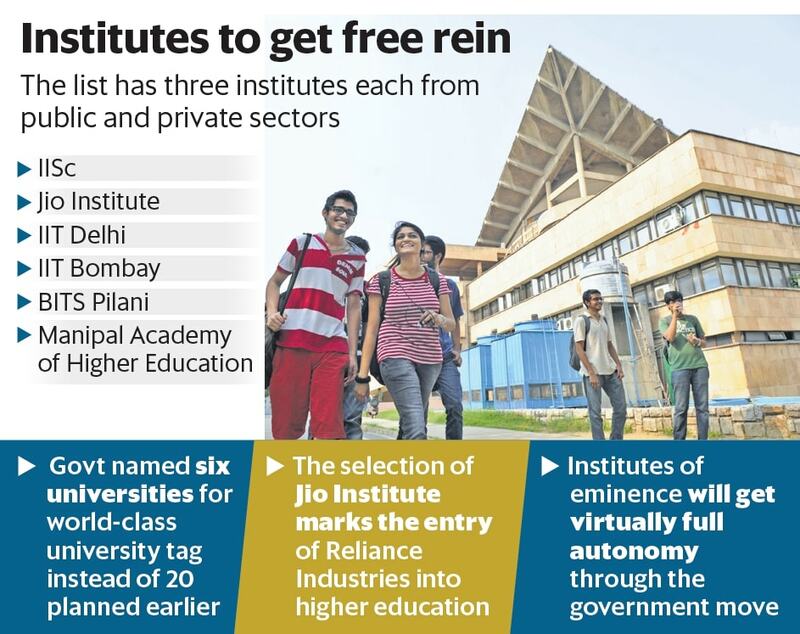 The six institutions included the Jio Institute, which is yet to be set up. In December, the committee recommended 19 more names, taking the total list to 30. Now the empowered expert committee has recommended 30 names – 15 in each category. What hinders granting more institutions? It was not just a question of naming the institutions, but also granting public institutions Rs 1,000 crore in special funds. The committee had not put its list of names in any preferential order or ranking. There are 139 Indian cities that breach air pollution standards but are not included in the Centre’s National Clean Air Programme (NCAP), says a report by Greenpeace. 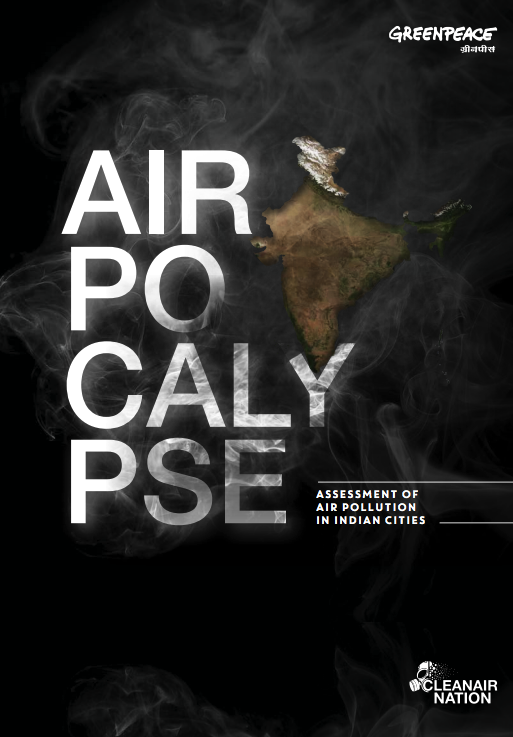 Airpocalypse III, as the Greenpeace report is titled, analyses air pollution data of 313 cities and towns for the year 2017. Of these 313 cities, 241 (77%) had PM10 levels beyond the National Ambient Air Quality Standards (NAAQS). That’s because the government’s list of 102 cities relied on average pollution data until 2015, whereas Airpocalypse III used data updated up to 2017. As part of the NCAP, cities have been given a specified number of days to implement specific measures such as “ensuring roads are pothole-free to improve traffic flow and thereby reduce dust” (within 60 days) or “ensuring strict action against unauthorized brick kilns” (within 30 days). It doesn’t specify an exact date for when these obligations kick in. Even if the NCAP were to able to reduce pollution by 30% by 2024, 153 cities would still be left with pollution levels exceeding the NAAQS, the report said. Since the data for 2017 was available when NCAP was finalised, it would have made more sense to update the non-attainment list to include all such cities in the final NCAP. 18 research institutions in India are among a group of 50 institutions called the South Asian Nitrogen Hub (SANH) — in the UK and South Asia to assess and study the quantum and impact of “nitrogen pollution” in South Asia. While nitrogen is the dominant gas in the atmosphere, it is inert and doesn’t react. However, when it is released as part of compounds from agriculture, sewage and biological waste, nitrogen is considered reactive. It may be polluting and even exert a potent greenhouse gas effect. Other than air pollution, nitrogen is also linked to the loss of biodiversity, the pollution of rivers and seas, ozone depletion, health, economy, and livelihoods. Nitrogen pollution is caused, for example, by emissions from chemical fertilisers, livestock manure and burning fossil fuels. Gases such as ammonia (NH3) and nitrogen dioxide (NO2) contribute to poor air quality and can aggravate respiratory and heart conditions, leading to millions of premature deaths across the world. Nitrate from chemical fertilisers, manure and industry pollutes the rivers and seas, posing a health risk for humans, fish, coral and plant life. NOx emissions grew at 52% from 1991 to 2001 and 69% from 2001 to 2011 in India. Agriculture is the largest contributor to nitrogen emissions. Non-agricultural emissions of nitrogen oxides and nitrous oxide were growing rapidly, with sewage and fossil-fuel burning — for power, transport and industry — leading the trend. The South Asian Nitrogen Hub (SANH) is a major international research programme to tackle the challenge that nitrogen pollution poses in South Asia. The SANH will be established with funding from UK Research and Innovation (UKRI) under its Global Challenges Research Fund (GCRF). 18 Indian research institutions are part of a group of 50 which have received £20 million funding from the United Kingdom Government. The SANH will study the impact of the different forms of pollution to form a coherent picture of the nitrogen cycle. In particular, it will look at nitrogen in agriculture in eight countries – India, Pakistan, Bangladesh, Nepal, Afghanistan, Sri Lanka, Bhutan and Maldives. Its recommendations will support cleaner and more profitable farming, as well as industrial recycling of nitrogen, fostering development of a cleaner circular economy for nitrogen. The first-of-a-kind report analyses the current and future importance of rail around the world through the perspective of its energy and environmental implications. Itexamines how the role of rail in global transport might be elevated as a means to reduce the energy use and environmental impacts associated with transport. The report reviews the impact of existing plans and regulations on the future of rail, and explores the key policies that could help to realize an enhanced future rail. This global report has a focus on India, elaborating on the unique social and economic role of rail in India, together with its great enduring potential, to show how India can extend and update its networks to harness rail at a scope and scale that is unparalleled. The IEA is an inter-governmental organisation that works to ensure reliable, affordable and clean energy for its 30 member countries and 8 association countries. Its mission is guided by four main areas of focus: energy security, economic development, environmental awareness and engagement worldwide. India has been the focus of many recent IEA analyses and reports for instance through the special focus chapter on the Indian Power sector of the Energy Technology Perspectives (ETP) publication and the World Energy Outlook (WEO). IEA has also held workshops and training programmes in India on energy data training, energy efficiency, strategic petroleum reserves, and the integration of renewables into the grid. Prelims level: Basic knowledge of Public credit registry (PCR). Mains level: The news-card analyses the issues and challenges in the establishment of a public credit registry (PCR), in a brief manner. There has been demand by experts for the establishment of a public credit registry (PCR) in India. According to them, building a robust and centralized credit information system will be able to bring transparency to the credit market that will allow borrowers to build up their “reputational collateral”, reward good borrowers and encourage credit discipline. India has a multiplicity of credit information repositories. As a result, it is very difficult for lenders to form a comprehensive view of the indebtedness of potential borrowers as their credit information is dispersed across multiple entities. Additionally, as the formats in which the data is required to be reported to each of these entities varies widely, there is no assurance about the quality of the data, even if it were to be aggregated. A PCR that operates as the single point of mandatory reporting of credit information, would remove these inconsistencies. And leading to improvements in data quality and offering a mechanism by which borrowers of all levels can establish the reputational collateral that is needed. It would additionally allow lenders to distinguish between different types of borrowers, avoiding the pitfall of adverse selection where lenders overcharge low-risk borrowers and undercharge high-risk borrowers simply because they don’t have accurate data. A registry of credit gives lenders an accurate snapshot of only the indebtedness of a borrower. It provides no information as to that person’s financial assets. In determining whether or not to grant a loan, lenders need to evaluate both the existing debt burden of the individual as well as the details of her financial asset portfolio to assure themselves that she will be able to service the loan. At present, lenders meet this second requirement by asking for copies of bank statements and other financial assets of the borrower and then physically verifying the copies presented to them against original records. The process is time-consuming and runs the risk of fraud. What is required is a trusted, electronic system through which borrowers can provide lenders with verifiable information about their financial assets in an auditable, electronic format that is both accurate and up to date. It is with this in mind that the Reserve Bank of India is establishing the account aggregator infrastructure. It is a digital architecture that offers borrowers a mechanism by which potential lenders can view their financial assets without compromising privacy and confidentiality. Central to this construct is the account aggregator, a regulated third-party entity whose sole function will be to maintain and operate a trusted platform on which registered users can link details of their financial accounts, such as bank accounts, mutual funds and insurance accounts. Whenever potential lenders need evidence of the financial assets of a potential borrower, they will have to issue an electronic request setting out details of the data sought and the purpose for which it will be used. To limit the risk of over-consenting, lenders will only be able to request limited information for specified purposes using templates that have been designed keeping in mind principles of data minimization and purpose limitation. Once this request has been received, the borrower can digitally consent to the specific request, thereby authorizing the account aggregator to extract the relevant information from the financial asset portfolio that has been linked. Based on the authority of the digital consent artefact, the account aggregator will instruct the relevant financial institutions to issue digitally signed copies of the required information to the lender. Some experts have aversion to an over-reliance on consent as a mechanism to safeguard privacy. However, the electronic consent artefact contemplated in the account aggregator framework is not the same as the over-broad, confusingly worded terms of service that we most frequently encounter. It is, to the contrary, a specific, one-time request for limited information, intended to be used for a clearly defined purpose. As much as this construct achieves the objective of purpose limitation, there is no way to ensure that once financial data has been provided, the recipients will only use it for the purposes for which it was requested. At present, there is no technological construct by which the data that has been provided using the account aggregator framework will automatically expire once its original purpose has been served. Nothing stops lenders from retaining, and using, data long after its purpose is served. It is for this reason that the account aggregator architecture needs to be firmly ensconced within an extended regulatory framework that imposes restrictions over and above that which is contained within the technological framework of the consent artefact. While technology offers new means by which results can be achieved, it is critically important that we remember to ground these solutions in appropriately robust legal frameworks. Mains Paper 3: Environment | Conservation, environmental pollution and degradation, environmental impact assessment. Prelims level: Basic knowledge of Waste to Energy plants. Mains level: The news-card analyses issues and challenges with Waste to Energy plants in India, in a brief manner. Waste to Energy (WtE) plants in our cities, using inadequately segregated municipal waste as feedstock, are highly dangerous because of the toxic gases and particulates they spew when they burn mixed waste in the process of incineration. Residents of Okhla and surrounding areas in Delhi have been protesting that the WtE plant in their vicinity is not complying with the stipulations of National Green Tribunal (NGT). It is not too much for an urban locality with houses, hospitals, schools and shops to want no industrial polluter in their midst. With its location within 30 metres of the residential areas, emissions remain a major issue with the residents. The plant was slapped a fine of Rs 25 lakh in February 2017 by the NGT but many questions about air quality standards in the area remain unanswered, including why the plant spews soot and ash in the neighbourhood. The authorities are considering the expansion of this WtE plant from 16 MW to 40 MW. The latest protests by the residents at a public hearing were reported in the press only a few days ago. The residents claim that the plant’s original Environmental Impact Assessment (EIA) issued to IL&FS bears no resemblance to the plant now in operation. A new EIA has been filed for the proposed expansion, and they are apprehensive about the proposal to add two boilers. There are five municipal WtE plants operational in India with a total capacity to produce 66.4 MW electricity per day. Of this, the lion’s share — 52 MW per day — is generated in Delhi by its three existing plants. There is also talk of setting up a new WtE plant with a capacity of 25 MW at Tehkhand in South-East Delhi. The bandwagon is rolling on with cities across different states vying for WtE plants as a quick and lazy solution to the complex challenge of solid waste management. The presence of chlorinated hydrocarbons like PVC results in the release of dioxins and furans when the waste is burnt at less than 850 degree C.
Appropriate filtering mechanisms need to be installed to control such dangerous emissions. Dioxins and furans are known to be carcinogenic and can lead to impairment of immune, endocrine, nervous and reproductive systems. 2. They are extremely difficult and costly to measure, as the experience of Okhla shows. In the past, joint inspections involving the residents have shown that the plant was being operated without the adequate use of activated charcoal to filter out dioxins, furans and mercury from the emissions. Even when incineration takes place under optimal conditions, large amounts of flue gases, mercury vapour and lead compounds are released. There is always about 30 per cent residue from incineration in the form of slag (bottom ash) and fly ash (particulate matter), which are also known to be serious pollutants of air and water. Even people living in the neighbourhood of the best-maintained plants in the West are said to be prone to higher levels of cancer and other illnesses. That is why WtE plants are being phased out in the West. Unfortunately, while the clamour for WtE plants is growing in India, their operations are neither strictly maintained nor adequately monitored. WtE plants in India are also inefficient in generating energy. Municipal waste in India has a very high biodegradable (wet) waste content ranging anywhere between 60 and 70 per cent of the total, compared with 30 per cent in the West. This gives our waste a high moisture content and low calorific value. Also, since Indian households have traditionally been recycling their waste such as paper, plastic, cardboard, cloth, rubber, etc, to kabadiwalas, this further lowers the calorific value of our waste. India’s Solid Waste Management policy requires that wet and dry wastes should not be mixed so that only non-compostable and non-recyclable wastes with at least 1,500 kcal/kg should reach WtE plants. Such waste comprises only 10 to 15 per cent of the total waste. The challenge of segregation at source is compounded by the municipal governments themselves when they use compacters to reduce the transport cost of the waste. Compacting compresses the waste and makes even gross segregation at the plant site impossible. In the absence of adequate feedstock of non-compostable and non-recyclable waste, it becomes necessary to use auxiliary fuel, adding to the cost of operating the plants. Private companies (mostly foreign) are keenly hawking “waste to energy solutions” to handle our growing volumes of urban waste. Our urban local bodies, which bear the responsibility for solid waste management in our cities, are easily misguided into adopting these “solutions”. They are themselves reluctant to make an effort at keeping wet and dry wastes, recyclable and non-recyclable wastes, unmixed. They find WtE plants an easy option to legitimise the burning of mixed waste. Municipal authorities should be made aware that WtE technologies are being phased out in the West. They should not be allowed unless the waste offered meets the criterion specified by the SWM Rules 2016. A crucial element of enforcement will be to first ensure that the waste is not mixed at the source of generation and then that the handling of waste is in unmixed streams. Even where outsourcing contracts clearly specify that handling must be in unmixed streams, there should be strict penalties for non-compliance. WtE plants using municipal solid waste from Indian cities as feedstock pose a serious threat to our health and environment. We must explore low cost options such as composting and bio-methanation. First things first: No mixing of waste at the point of generation. Mains Paper 3: Economy | Indian Economy and issues relating to planning, mobilization of resources, growth, development and employment. Prelims level: Basic knowledge Universal Basic Capital. Mains level: The news-card analyses the issue that a simplistic universal basic income will not solve the fundamental problems of the Indian economy, in a brief manner. India’s GDP is growing quite well. However, India needs to do much better to improve overall human development, in which it continues to be compared with countries in Sub-Saharan Africa. Even India’s poorer sub-continental neighbours are improving health and education faster. Benefits of India’s economic growth must trickle down much faster to people at the bottom of the pyramid: to poorer farmers, landless rural labour, and hundreds of millions of workers living on the edge in low-paying, ‘flexible’ forms of employment with no social security. (a) that there is no problem. (c) a universal basic income (UBI) to be provided by the state. Many economists are juggling with statistics to prove that the Indian economy is doing quite well. According to them, it is providing enough jobs and statistically, poverty has reduced a lot. However, a lot more must be done to improve education and health care. And to address the persistent informality and small scale of enterprises that are providing most of the employment in the country. An ideological solution that the government is unable to provide them is more privatisation of public services. However, the private sector is structurally not designed to provide affordable public services equitably. Businesses run with a profit motive. They cannot take on the burden of subsidising citizens who cannot pay for their services. Structural forces within the global economy have been driving down wages and creating insecure employment while increasing the mobility of capital and increasing incomes from ownership of capital. ‘Industry 4.0’, which has not yet spread too far, is expected to worsen these problems. An economic consequence of declining growth of wage incomes will be reduction of consumption. Which will create problems for owners of capital and automated Industry 4.0 production systems. For, no one will buy all the material and services that these systems will produce. Therefore, the UBI has appeared as a silver bullet solution. It will be an income provided to everybody by the very state that the capitalists say should get out of their way, and to whom they are unwilling to pay more taxes. The beauty of a ‘universal’ basic income is that it avoids messy political questions about who deserves assistance. It also side-steps the challenge of actually providing the services required: education, health, food, etc. Just give the people cash and let them buy what they need. Some economists who were proponents of UBI have now begun to dilute their simplistic concept of UBI to make it financially and politically feasible. They propose a QUBRI (quasi-universal basic rural income), targeted only at poorer people in the rural areas. The scheme is no longer universal. It will exclude the not-so-poor in rural areas as morally it should. Political questions about who should be included will have to be addressed. It will not cover the masses of urban poor working for low and uncertain wages. Therefore, some other schemes will have to be drawn up for the urban sector, and entitlement and measurement issues will have to be addressed for these schemes too. All the schemes (rural and urban) could be cash transfer schemes, which Aadhar and the digitisation of financial services will facilitate. However, this still begs the question about how to provide good quality public services for people to buy. An unavoidable solution to fix India’s fundamental problems is the strengthening of institutions of the state to deliver the services the state must (public safety, justice, and basic education and health), which should be available to all citizens regardless of their ability to pay for them. The institutions of the state must be strengthened also to regulate delivery of services by the private sector and ensure fair competition in the market. The building of state institutions, to deliver and to regulate, will require stronger management, administrative, and political capabilities. A better solution to structural inequality than UBI is universal basic capital (UBC) which has begun to pop up in international policy circles. In this alternative approach, people own the wealth they generate as shareholders of their collective enterprises. Amul, SEWA, Grameen, and others have shown a way. (a) Focus on building state capacity beginning with implementation of the recommendations of the Second Administrative Reforms Commission. (b) Strengthen the missing middle-level institutions for aggregation of tiny enterprises and representation of workers. (c) The creativity of economists could be better applied to developing ideas for UBC than UBI. Mains level: CMB-Bharat will be path breaking project along with various ongoing projects such as LIGO etc. CMB stands for Cosmic Microwave Background, and the scientific space project CMB-Bharat has been presented as a proposal to ISRO and is under consideration. In the workshop, project CMB-Bharat, which could help us listen to the faintest murmurs of the early universe, was discussed. CMB-Bharat is a proposal for comprehensive next generation Cosmic Microwave Background (CMB) mission in international collaboration with major Indian contribution. This referred to quantum gravitational waves, which are different from what LIGO detectors had observed that were classical in nature. The cosmic microwave background (CMB) is thought to be leftover radiation from the Big Bang, or the time when the universe began. As the theory goes, when the universe was born it underwent a rapid inflation and expansion. The universe is still expanding today, and the expansion rate appears different depending on where you look. The CMB represents the heat left over from the Big Bang. We can’t see the CMB with your naked eye, but it is everywhere in the universe. This means its radiation is most visible in the microwave part of the electromagnetic spectrum. CMB-Bharat mission presents an unique opportunity for India to take the lead on prized quests in fundamental science in a field that has proved to be a spectacular success. However there are no active proposals for a comprehensive next generation CMB space mission at this time. The details of the first survey of captive elephants in the country were submitted in an affidavit by the MoEFCC to the Supreme Court. The affidavit comes in the wake of rising elephant deaths and human-elephant conflicts, particularly in Kerala and Assam. According to the affidavit, there are 2,454 elephants in captivity, of which 560 are in possession with forest departments and 1,687 with private individuals. However, 664 of the total captive elephants in the country are without ownership certificate while there are 85 in zoos, 26 in circuses and 96 in temples. The affidavit covers data for 28 states and Union Territories. 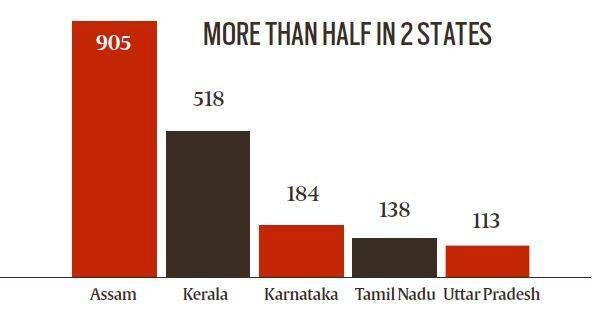 It shows that Assam and Kerala account for more than half the nationwide total of 2,454. Assam has 37% of these captive elephants and Kerala has 21%. Concentration in two states means a wide gap with the count in other states — the third highest is Karnataka’s 184, roughly one-fifth of Assam’s 905 and a little over one-third of Kerala’s 518. Of these, one-third are in private custody without any ownership certificate mandated by law; zoos, circuses and temples account for 207 elephants in captivity. In Nov 18, the Court had pulled up the Animal Welfare Board of India (AWBI) for not having data on the number of elephants held captive. The apex court had directed the MoEFCC to identify elephants in captivity and whether their owners have an ownership certificate. It was hearing a writ petition filed by Wildlife Rescue and Rehabilitation Centre. The bench has now directed the Chief Wildlife Wardens of states to ascertain the age of all the captive elephants. Mains level: Competency of Indian Education System in the World. The HRD Ministry has signed a pact with the Organisation for Economic Cooperation and Development (OECD) for the participation of students from Central government schools in PISA-2021. It will be a competency-based test, which evaluates the learning level of 15YO students in reading, mathematics and science. The outcomes of the test will be used to do more teacher training programmes and curricular reforms. The questions in the test will be contextualized according to the Indian setting to help students understand them better. Schools run by Kendriya Vidyalaya Sangathan (KVS), Navodaya Vidyalaya Samiti (NVS) and schools in the UTs of Chandigarh will participate. Primary and Secondary Education – RTE, Education Policy, SEQI, RMSA, Committee Reports, etc. In a significant find in the global spread of multi-drug resistant (MDR) bacteria, scientists have found a “superbug” gene — first detected in New Delhi over a decade back — in one of the last “pristine” places on Earth that is some 12,870 km away. With increasing tiger count in India, global experts and officials in the government suggest that India must also prepare for a new challenge — of reaching the limits of its management capacity. But experts from the Global Tiger Forum, said that India’s current capacity to host tigers ranged from 2,500-3,000 tigers. With dwindling core forest as well as the shrinking of tiger corridors, there are several challenges — alongside the traditional challenges of poaching and man-animal conflict. When tiger recovery efforts began 50 years ago we had about 2,000 tigers. If after all this effort and expenditure, we are satisfied with just 3,000 tigers, it points at a serious management problem. Needlessly huge amount of money is being dumped repeatedly on the same 25,000-30,000 sq. km area where tigers are already at saturation densities. However other areas with potential for future recovery are starved of key investments. There are vast tracts of potential tiger habitat that can be used to improve prey density, develop tiger corridors and therefore support a much larger population. Since 2006, the WII has been tasked with coordinating the tiger estimation exercise. The once-in-four-years exercise calculated, in 2006, that India had only 1,411 tigers. This rose to 1,706 in 2010 and 2,226 in 2014 on the back of improved conservation measures and new estimation methods. The 3rd Stock Taking Conference on Tiger Conservation was recently inaugurated in New Delhi. Third in a series of Stock Taking Conferences, this is the second to be held in India after 2012. The conference is being hosted by the National Tiger Conservation Authority, MoEFCC in close collaboration with the Global Tiger Forum. Barring China, all other tiger-range countries — Thailand, Laos, Vietnam, Cambodia, Russia, Indonesia, Malaysia, Bangladesh, Bhutan, Myanmar, India and Nepal — were part of the conference in New Delhi. The member countries have signed a declaration to double tiger numbers by 2022. Prelims level: Basic knowledge of India’s presidency at G20 in 2022. Mains level: The news-card analyses the issues and challenges that India might face while hosting G20 summit in 2022, in a brief manner. In 2022, India will be hosting the G20 or Group of 20 nations, the world’s most influential economic multilateral forum. G20 is the agenda-setting forum that develops and guides rules of global economic governance. The G20 leaders-level dialogue came into being during the western financial crisis of 2008, when the large developing economies including India and China, helped fund the G8 countries out of the crisis. Here, developing countries can display their political, economic and intellectual leadership on a par with the most powerful countries. The G20’s rotating presidency ensures that no one country dominates the agenda. Instead, the G20 host sets an annual agenda, wielding vast direct and indirect influence on nations’ economies. Is India ready for G20 leadership? At some levels, India is ready. Indian business and industry is becoming a noteworthy competitor globally. The country’s domestic economy is starting to pick up, thanks to structural economic reforms. The central government is economically stronger, and the states are starting to learn about economic independence, making them more aligned with their global counterparts. India need to have a clear global financial agenda. The country should also have the capacity to lead the G20 year intellectually, financially, managerially and administratively. Geopolitically, India is more internationally engaged but less so geoeconomically. Its narrow focus is on the World Bank, IMF, WTO and foreign investment issues. But India has much to contribute on issues like reconfiguration of global financial regulations, design of a new framework for trade in services and the digital economy and establishing better cross-border standards for transparency in financial flows. To make its G20 year a success, India has to address organisational challenges, where the country has an infrastructure, management and intellectual gap. A G20 presidency brings together several global leaders, their attending delegations, and independent experts. Unlike the Olympics and more like Davos, this effort is focused on a small but powerful group which expects good airports, accommodation, conference facilities, and communications infrastructure all year round. 2. The president of the G20 is tasked with leading and managing the global economic agenda for the year. This is typically undertaken by the finance and foreign ministry and a special appointee as G20 sherpa, which together act as the secretariat to the G20 presidency. In India, the ministries have fine officers with this knowledge, but they are overworked and limited by their short tenures. Global economic governance is no single ministry’s mandate. For example, the ministries of commerce, energy, agriculture have deep stakes in the emerging global economic architecture. The RBI and SEBI play a crucial role in contributing to the formulation of global financial regulations. They all have to work as one. 3. The logistical exercise is monumental, and unprecedented for India. While India has organised annual conferences like Vibrant Gujarat, the G20’s all-year requirements are more intense and sophisticated. It needs an energetic secretariat to organise over 150 high-level ministerial, sub-ministerial and sub-forum meetings through the year. At least 50 task forces lead scores of meetings including those by sub-forums for think tanks and business. Then there is content management, negotiation and feedback processes and developing and executing the year-long agenda. India’s closest experience was in 2016 when as chair of the five BRICS countries, the government led over 100 meetings but with uneven success in the presidency year. 4. Intellectually, India is constrained on capacity. There is limited expertise within think tanks or academia on this subject. It requires deep inter-disciplinary research on the international monetary system, global financial architecture, global trading system, and global climate, energy and sustainability issues. This restricts India to being a passive rule-taker, not rule-maker or designer of global economic rules. Consequential economic decisions are then driven by the West, and increasingly by China — neither of which are suitable for an India that should be a leading thinker of the new global economic era. Hosting a successful G20 presidency in 2022 is a welcome challenge and the preparations must begin now. Like other countries, the government will have to work together with its think tanks, businesses and civil society to develop a working mechanism and an agenda for 2022. India is a growing, emerging economy but leads no global economic forums. It is said that “those who hold the pen, write the rules”. The time has come for India to both hold the pen and write the rules for a more equitable global economics and governance. Mains Paper 2: Social Justice| Issues relating to development and management of Social Sector/Services relating to Health, Education, Human Resources..
Prelims level: Basic knowledge of public health and health services in India. Mains level: The news-card analyses the challenges of India’s public health system vis-à-vis its health services system, in a brief manner. In India, public health and health services have been synonymous. This integration has dwarfed the growth of a comprehensive public health system, which is critical to overcome some of the systemic challenges in healthcare. A stark increase in population growth, along with rising life expectancy, provides the burden of chronic diseases. Tackling this requires an interdisciplinary approach. An individual-centric approach within healthcare centres does little to promote well-being in the community. Tight laws, regulations around food and drug safety, and policies for tobacco and substance use as well as climate change and clean energy are all intrinsic to health. But they are not necessarily the responsibilities of healthcare services. As most nations realise the vitality of a robust public health system, India lacks a comprehensive model that isn’t subservient to healthcare services. India’s public health workforce come from an estimated 51 colleges that offer a graduate programme in public health. This number is lower at the undergraduate level. In stark contrast, 238 universities offer a Master of Public Health (MPH) degree in the U.S. In addition to the quantitative problem, India also has a diversity problem. A diverse student population is necessary to create an interdisciplinary workforce. The 2017 Gorakhpur tragedy in Uttar Pradesh, the 2018 Majerhat bridge collapse in Kolkata, air pollution in Delhi and the Punjab narcotics crisis are all public health tragedies. In all these cases, the quality of healthcare services is critical to prevent morbidity and mortality. However, a well organised public health system with supporting infrastructure strives to prevent catastrophic events like this. Public health tracks range from research, global health, health communication, urban planning, health policy, environmental science, behavioural sciences, healthcare management, financing, and behavioural economics. In the U.S., it is routine for public health graduates to come from engineering, social work, medicine, finance, law, architecture, and anthropology. This diversity is further enhanced by a curriculum that enables graduates to become key stakeholders in the health system. Hence, strong academic programmes are critical to harness the potential that students from various disciplines will prospectively bring to MPH training. While benefits from population-level investments are usually long term but sustained, they tend to accrue much later than the tenure of most politicians. This is often cited to be a reason for reluctance in investing in public health as opposed to other health and social services. This is not only specific to India; most national health systems struggle with this conundrum. A recent systematic review on Return on Investment (ROI) in public health looked at health promotion, legislation, social determinants, and health protection. They opine that a $1 investment in the taxation of sugary beverages can yield returns of $55 in the long term. Another study showed a $9 ROI for every dollar spent on early childhood health, while tobacco prevention programmes yield a 1,900% ROI for every dollar spent. The impact of saving valuable revenue through prevention is indispensable for growing economies like India. Legislation is often shaped by public perception. While it is ideal for legislation to be informed by research, it is rarely the case. It is health literacy through health communication that shapes this perception. Health communication, an integral arm of public health, aims to disseminate critical information to improve the health literacy of the population. The World Health Organisation calls for efforts to improve health literacy, which is an independent determinant of better health outcome. India certainly has a serious problem with health literacy and it is the responsibility of public health professionals to close this gap. Equally important is a system of evaluating national programmes. While some fail due to the internal validity of the intervention itself, many fail from improper implementation. Programme planning, implementation and evaluation matrices will distinguish formative and outcome evaluation, so valuable time and money can be saved. The public health system looks at the social ecology and determinants focusing on optimising wellness. Healthcare services, on the other hand, primarily focus on preventing morbidity and mortality. A comprehensive healthcare system will seamlessly bridge the two. A central body along the lines of a council for public health may be envisaged to synergistically work with agencies such as the public works department, the narcotics bureau, water management, food safety, sanitation, urban and rural planning, housing and infrastructure to promote population-level health. The proposed council for public health should also work closely with academic institutions to develop curriculum and provide license and accreditation to schools to promote interdisciplinary curriculum in public health. As international health systems are combating rising healthcare costs, there is an impending need to systematically make healthcare inclusive to all. While the proposed, comprehensive insurance programme Ayushman Bharat caters to a subset of the population, systemic reforms in public health will shift the entire population to better health. Regulatory challenges force governments to deploy cost-effective solutions while ethical challenges to create equitable services concerns all of India. With the infusion of technology driving costs on the secondary and tertiary end, it is going to be paramount for India to reinvigorate its public health system to maximise prevention. India’s public health system can no longer function within the shadow of its health services. Mains Paper 2: Social Justice| Welfare schemes for vulnerable sections of the population by the Centre and States and the performance of these schemes; mechanisms, laws, institutions and Bodies constituted for the protection and betterment of these vulnerable sections. Mains level: The news-card analyses the recent ruling of the SC in V. Surendra Mohan v. Union of India, in a brief manner. Recently the Supreme Court of India has given a ruling in V. Surendra Mohan v. Union of India case which is regarded by the experts as one of the darkest in India’s disability rights movement. The Court had to rule on the legality of the Tamil Nadu government’s policy of reserving the post of civil judge only for people whose percentage of blindness does not exceed 40-50%, resulting in the exclusion of the applicant who was 70% blind. It held that the government’s decision was rational and reasonable. It ruled that a judicial officer has to possess a reasonable amount of sight and hearing to discharge her functions. It accepted the claim that impaired vision makes it impossible to perform the functions required of judicial officers, such as assessing the demeanour of witnesses and reading and analysing evidence. It also accepted that asking a blind judicial officer to perform such administrative functions as recording dying declarations and conducting inquiries can result in avoidable complications. However, the judgement is being seen as problematic by the experts for four key reasons. The view that a totally blind person cannot thrive as a judge is belied by several examples of successful judges who are blind. U.S. Court of Appeals DC Circuit judge David S. Tatel, who thinks that it is neither fair nor accurate to impose low expectations on what blind lawyers can do. Yousaf Saleem who last year became Pakistan’s first blind civil judge. 2. How can a blind person be reasonably expected to thrive as a judge without being excessively dependent and inefficient? 3. The Court’s unreasoned assertion is an outcome of their ignorance about the capabilities of the disabled. However, ignorance simply cannot be an excuse. It is simply unacceptable to condemn disabled legal professionals, possessing the intellectual wherewithal to be a judge, to the status of outcasts only because the judges delivering the judgement in this case appear simply not to have bothered to notice the competence of the millions of disabled people who inhabit this world. As to obviating avoidable complications, the reasonable accommodations required by a blind judge may be considered irksome. The constitutional promise of equality cannot be fully realised, if we lack the ability to even pay the price of making reasonable accommodations. When the Supreme Court tells that blindness makes someone intrinsically incapable of becoming a judicial officer, when it declares thousands of blind people as incompetence, its declaration cuts to the core of their confidence about the fairness and robustness of our judicial system. It is how we choose to respond to this institutional display of pure and simple discrimination dressed up as legal reasoning will be reflective of what kind of a society one hope to be.